Our garden here in Italy has flourished this season, and it could be due to the four truckloads of new soil we added last year, or that we’ve had great weather this summer with moderate temperatures and not too much rain. Our zucchini plants called it quits a couple of weeks ago, however, but I have to say before they finished for the season, we did get a lot of freshly picked zucchini from them. 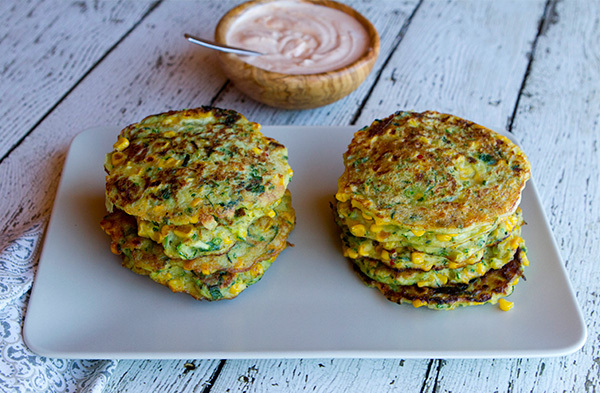 One of the dishes I often make when zucchini are in season is zucchini pancakes (or fritters). They are easy to prepare, and you can serve them with a wide variety of sauces or garnishes. Italians do not eat a lot of corn, so it is rare to find corn on the cob sold at local produce markets or grocery stores. We do have one local grocery that seems to cater to foreigners, and for the first time, I am now able to buy fresh corn on the cob. Growing up in Ontario where Green Giant corn was grown, I spent my summers as a child enjoying neighborhood corn roasts, and I am thrilled to be finally able to buy fresh corn. I recently decided to combine corn and zucchini in a pancake, and served them with a chipotle sauce. 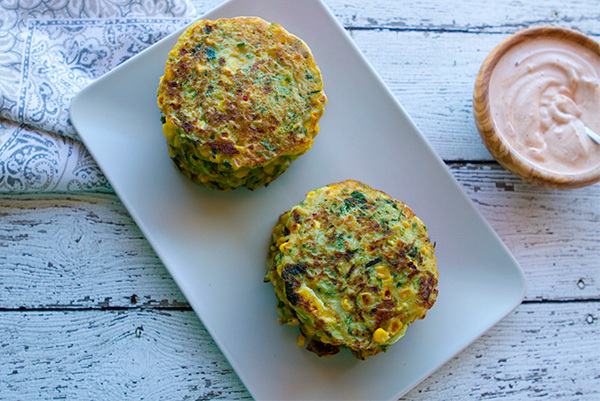 I lightened up my sauce by using fat-free Greek yogurt in place of sour cream, and it paired perfectly with these tender zucchini patties. These patties are just as good the next day gently warmed in a moderate preheated oven. Zucchini is high in fiber, water, vitamin A, vitamin C and potassium which boost your immune system and promote the health of your heart, skin, lungs and eyes. Corn is a good source of antioxidants and high in fiber. Replacing sour cream with fat free Greek yogurt is an easy way to lower fat grams without losing flavor. Place the zucchini in a colander and sprinkle with salt. Place a small plate and a weight (large can) on the zucchini and let drain for 30 minutes. While the zucchini is draining, use a sharp knife to remove the corn kernels from the cob. Heat 2 tablespoons of coconut oil in a skillet over medium heat and cook the corn and onion until just tender to the bite, about 7 to 8 minutes. Squeeze as much liquid from the zucchini as possible, then place in a bowl along with the corn, onion, and garlic. Add the flour, baking soda, salt, pepper, buttermilk, egg, and basil to the bowl and stir until mixed. Clean out the skillet and add a tablespoon of coconut oil. Heat over medium heat until very hot, then use a 1/3 of a cup scoop to add the zucchini mixture to the skillet, flattening it slightly with the back of a spoon. Cook on each side until lightly browned, about 2 to 3 minutes per side. 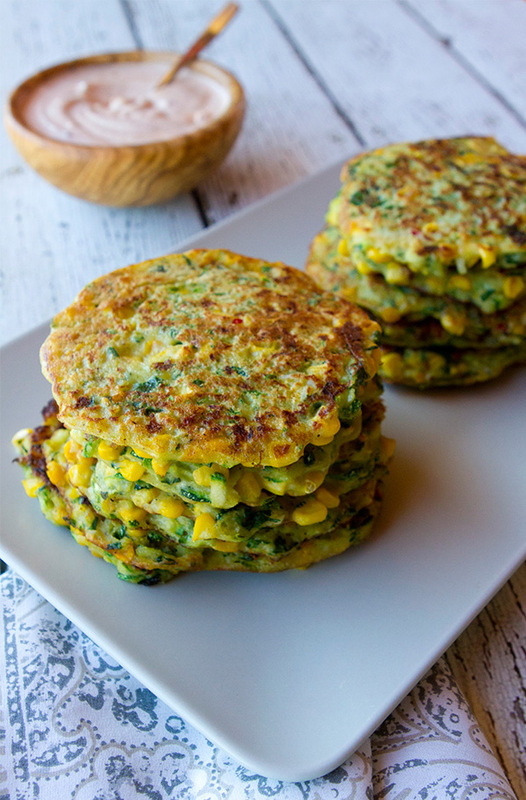 Continue to cook all the zucchini batter in this manner, keeping the cooked patties warm in the oven. Mix together the yogurt, chipotle, salt, pepper, and lime zest in a small food processor and blend until smooth. 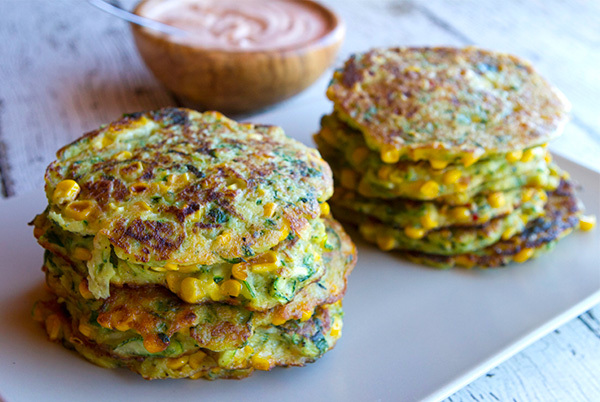 Serve the zucchini patties warm with the chipotle sauce on the side.